A few years ago I was the "new girl" in a small office at a staffing agency. One of my coworkers decided it would be a good idea to order a pizza from a little place he liked and all split the cost for lunch. I chipped in and when the others decided to order their favorite "white pizza" I felt totally cornered. I figured I would be going hungry that day! My coworker went to pick it up and when he got back they divvied up the pizza on plates and brought me mine. I figured, since I was the new girl, I should eat a little to be polite, but I had absolutely no intentions of eating any more than that... Until I tasted it! It was, hands down, the best pizza I had ever had. Now, white pizza is my absolute favorite. 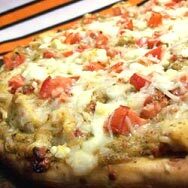 A nice white sauce with chicken and veggies will beat an old classic pepperoni any day of the week! Over the years I have eaten pizzas with several different white sauces and many, many toppings (although I still think that first one is my favorite) . Here are some sauces and pizzas to try. 1. Heat butter in a small saucepan. Add flour and stir until thoroughly mixed. 2. Slowly whisk in milk, adding gradually. Stir in remaining ingredients. Will thicken upon standing. Makes 2 pizzas. In a medium saucepan over low heat, heat butter and stir in flour to form a roux. Allow flour to brown slightly, but do not permit it to burn. 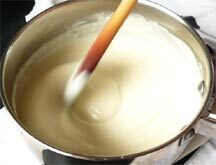 Once the roux has been created, whisk milk in slowly and gradually, avoiding lumps. Cook the sauce thus formed until desired thickness is reached, and then stir in cheese and spices slowly. Allow cheese to melt and mixture to become smooth and creamy. Allow to cool slightly, then top pizza. Tops 1-2 pizzas. In a small bowl, mix together the butter, olive oil, garlic, pesto, basil, oregano, Parmesan cheese and Alfredo sauce. Arrange the chicken on top of the pizza crust. Pour the Alfredo sauce mixture evenly over the chicken. Top with tomato and feta cheese. Bake for 10 to 15 minutes in the preheated oven, until the crust is lightly browned and toppings are toasted. Cut into wedges to serve. Makes 1 large (15") pizza. Spread crust with garlic butter. In a large non-stick skillet, heat oil and add onion, mushroom, peppers. Cook until vegetables are soft, about 10 minutes. Push veges to one side of the pan and add steak-ums and cook until done, about 5 minutes. Mix with veges. Add salt and pepper. *If using sliced roast beef, add to pan with veges and heat through. Add salt and pepper. Place onto pizza crust. Add Cheese. Bake for 10-12 minutes. Serves 4.